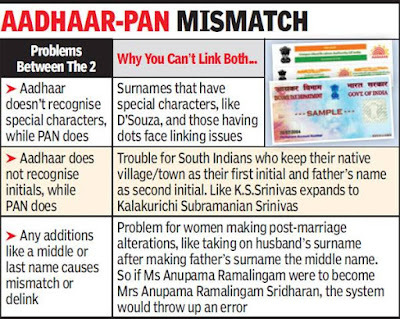 Linking of PAN card with Aadhaar card is easy when the name /date of birth /gender matches in both Aadhaar and PAN card. For those peoples for whom the authentication process gets failed it is because of the difference in data in both the documents. We are given to understand in most cases, the problem is mainly due to differently spelt names. Kindly check your name, in Aadhaar and PAN card. cases you get the authentication error. As of now, one easy way of doing is to correct the Aadhaar card name as Raja Singh by online process. 2.Login using the Aadhaar number and OTP and request for a name change (the mobile number should be already registered / currently working). 3.Upload a scanned copy of PAN card as supporting / proof document. 4. Once the process is complete you will be get the new Aadhaar card with the name change couriered in couple of days. With the updated Aadhaar card, linking of Pan and aadhaar can be done.